Down on their luck, Ferrari have described the Singapore GP as boring, but as Matt 'Trumpets' Ragsdale proves, it was nothing but, with action going on up and down the field. The race engineers were well into it, cars on the grid as the fallout from yesterday's qualifying echoed throughout the internet, with Raikkonen confirming they did have issues getting the tyres where they wanted them, echoed by KMag on the grid as he spoke with Brundle. Verstappen's PU issues very much a mapping thing according to Horner, but he was unusually uncritical of the French manufacturer as Red Bull were the earliest adopters of the Spec C engine, and were quite happy with it's increased power, feeling that it was a numbers issue that Renault could and would sort. One stop will be the preference of all the teams with a pit delta of nearly 27 seconds, but reports on the Hypersoft degradation indicates that it will be balanced on a knife edge. 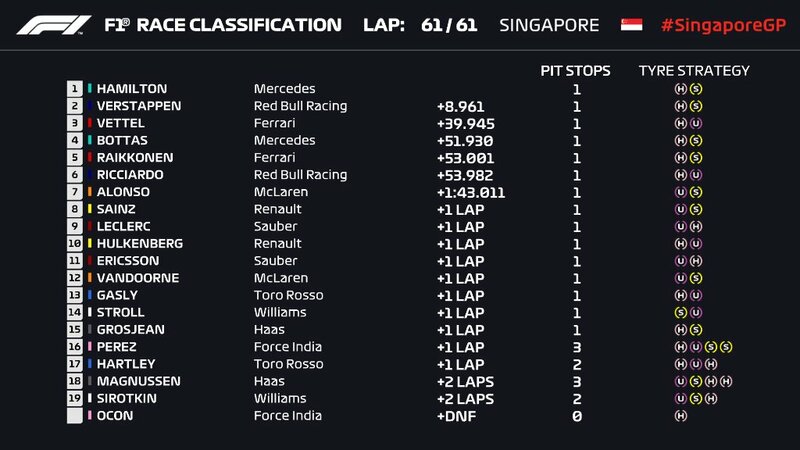 Of course, given the 100% Safety Car record at Singapore, look for the teams to try and take advantage for a reduced price pit stop unless, as is likely, it happens on the first lap, as the Softs show very little degradation. It was clearly Red Bull's preferred strategy to go one stop, as they still lack the last tenth or two to fight directly with Ferrari and Mercedes and Verstappen was fastest of all on the Soft tyre. For the midfielder's starting on the Ultra's it offers a huge advantage, and Alonso in P11 was well positioned to convert this for McLaren, a points position very much on offer if he and the rest of the midfield can survive the almost certain carnage of Lap 1. Lights Out!!!! Decent start from Hamilton as Vettel got the jump for P2 as they careened toward T1. Verstappen was on it and positioned his car well, smartly blocking off the Ferrari as the first turns unwound. Behind, the rest of the top 6 followed safely through with no change and then Ocon and Perez got into it and into the wall went Esteban on the exit of T3. Ahead, into T7 Vettel got Verstappen by draining his battery and taking P2 just as the Safety Car was out to cover the Force India intramural carnage. On replay, Perez went into T3 with Esteban on his outside and with a wee twitch of the wheel from Sergio contact with Ocon was made as their front tyres clashed which sent the Frenchman directly into the wall. Alonso and Sainz into the points with the fallout from that and Sirotkin somehow with a deranged wing that was definitely going to require a pitstop. Lap 4 the Safety Car was in and the restart games were on, with Lewis catching the Ferrari perhaps a bit unawares. During the Safety Car interval, Verstappen was again complaining that he was getting "forced neutral" between gearshifts, which admittedly does sound a bit distracting. As they rocketed through the first full lap at speed, the gaps were already going out, with Vettel working hard to keep Hamilton within DRS as he had already missed his best chance to get by on the restart. 1:48 for Lewis on full tanks and he was gone, outside DRS as he hit S2 of the following lap. Behind, it was tight as Verstappen tried to tighten the screws on Vettel and Bottas and Raikkonen behind all were well within a second of one another. Those gaps expanded as the next lap ticked over and then it was just Verstappen who was close, for a moment, before the engineers enforced a management phase no doubt mandated by the fragile Hypersofts hitting their limits. 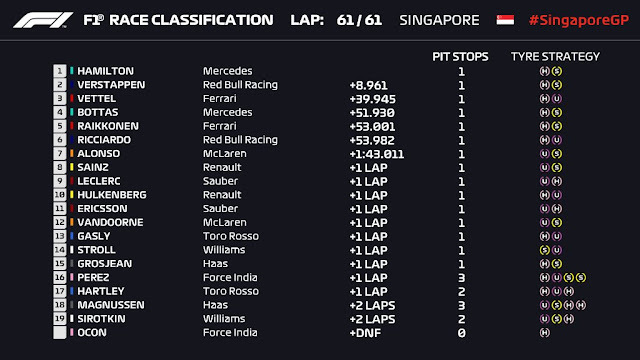 With the sharp end working towards a one stop the action had devolved to Hulkenberg, in P11 and on the Hypers, leading a train of Gasly, Leclerc, Ericsson and Magnussen all within DRS as Lap 9 rolled into the books. With the difficulty of overtaking, the undercut game was very seriously on, and with the pit window for the Hypers opening on lap 10 all the top runners were on their guard. The biggest gap in the top 6 was Ricciardo, at just over 2 seconds off Raikkonen ahead. But the bigger consideration for the frontrunners was the traffic they would encounter with the long pitstop. Into lap 11 and looking back 28 or so seconds it would be P17 and a bit of a sit behind the Vandoorne on the Ultras for whoever decided to pull the trigger first. But the clever boffins had been clever and Hamilton reported plenty of life in his tyre. Or was it the opposite, as Vettel then was told Hamilton had said the opposite and Seb flatly replied "I don't believe them". Regardless, Hamilton was into the 1:45's on lap 14 as Vettel let the leash slip, now 2 seconds back as he seemingly sought to maximise his tyre advantage. Ricciardo was the only one of the top 6 who looked genuinely off the pace, at 3.5 seconds astern of Raikkonen. Lap 15 and Vettel pulled the trigger on a pitstop, going for the undercut and he was out ahead of Grosjean with a gap to drive into, albeit with Perez to clear. Lewis responded with a fast lap and in he went..... tick tick tick... and out in front of both Perez and Vettel rocking a new pair of Softs. Perez was rather nonchalant about being stuck between the two while ahead, not only was Hamilton making hay, but at the front with clear air, Verstappen was doing his best to claw back P2 as he had yet to pit and was driving into clear air at the front of the race. Lap 17 and Vettel was by into T1, but the damage was done, 4.5 seconds to Hamilton and making it worse, Verstappen was in... neck and neck on the way out and Max just edged him on the exit, with Vettel desperately trying to hold on round the outside of T3 and failing. Making matters worse, Ferrari had chucked him on the Ultras, which were on edge to make the end of the race, especially relative to the Softs that his closest competitors were running. Confirming the bad news, Vettel radioed in lap 19 that he felt that the tyres would not last, and rather sarcastically enquired if anyone else was tight that he should no about, strongly implying Ferrari had missed Red Bull's move. In the midfield, the pit stops had started as well and the wash from that was Hulkenberg had gained a spot on RoGro, with all the one stoppers running behind Sirotkin, who pitted early under the Safety Car, and Stroll, both going long on the Soft tyre. Both Perez and Hulkenberg had chosen the Ultras whilst Grosjean had gone with the Softs, potentially a big advantage at the tail end of the race. Lap 22 and Raikkonen continued to lead, though he warned the team that his tyres could go "at any time". His report made it seem as if he had gone through a graining phase and they had improved, but in he went but for a pair of Softs, based on the reports from Vettel, no doubt. Out behind Bottas with fresher tyres and about 4 seconds of clear air to run into he went, as Perez checked the team for putting him out behind Sirotkin, who was proving quite the obstacle for Perez. Lap 25 and it was Verstappen, engine issues aside, slowly closing on Hamilton, provoking a touch of anxiety from the WDC leader that perhaps he HAD stopped too early. But it was the Perez debacle that was taking center stage as ahead of Perez, Alonso was about 1 lap from being able to clear Perez and Sirotkin with his pitstop, which would put him effectively P7 as small spits of rain were expected between T8-T11. 2 laps later Gasly's tyres gave it up, and it was just 2 corners for Leclerc to take advantage and rock by on exit of the bridge by cutting inside as Gasly locked it up and went wide. At the front Ricciardo continued to lead, but it was to be his last as onto the Ultras he went, having extended his stint to lap 28 and being well set to take advantage of his fresher, faster tyres. Gasly was in and out on a set of Ultras, well behind his teammate as Perez continued to be bottled behind Sirotkin and Alonso looked well provisioned to steal best of the rest from the entire midfield. Sainz, 4 seconds back and potentially LeClerc also had the potential to take advantage as Perez began to whine incessantly about Sirotkin's defending as he saw he race receding into the massive gap ahead of the Williams driver. Lap 34 and it was Sainz also well clear of the Sirotkin bottleneck in his pit window when Perez finally lost his mind and in a desperate bid to pass dove up the inside into T13 and plunged directly into the side of the Williams. Puncture for Perez and although Sirotkin did his best with his wounded Williams, Hulkenberg was quick to get round although the next obstacle on the road was the other Williams, driven by Stroll. Ricciardo put in fast lap the following 2 laps as he began to extract some performance from his Ultras, but the gap to Raikkonen was still rather large, albeit with plenty of laps to go. Lap 37 and the fun was over, as Ricky Danny had to dial it back as his tyres hit the top of their windows. 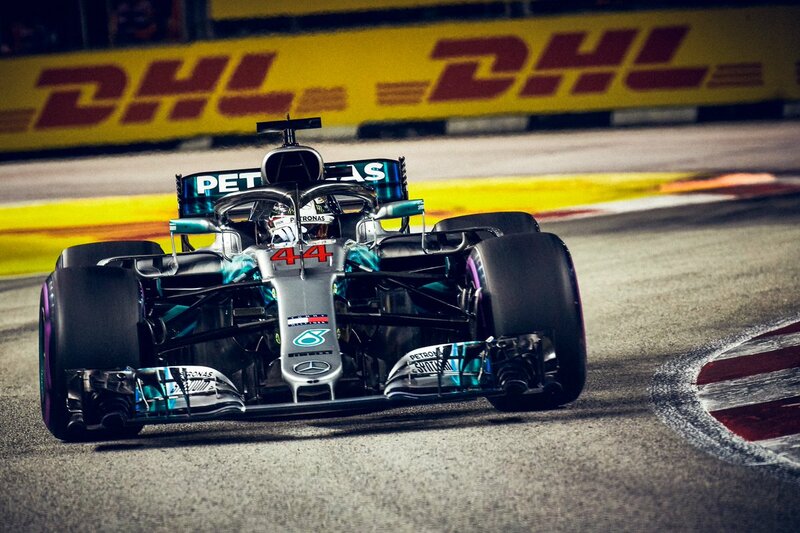 At the front, Hamilton reported a step loss in performance, with his engineers telling him that his tyres were actually on the cold side, meaning they had retained more life. More problematic, he was also onto the back of the train led by Sirotkin. Gasly and the Toro Rosso's yielded within the regulations, but in a fit of glorious timing Grosjean had just attacked Sirotkin and as the red mist descended, they completely ignored the blue flages screaming at them from the side of the track. It was a multi-turn battle, and it completely opened the door for Verstappen, with Hamilton completely balked by the furious action that only ended when Sirotkin rather firmly eased RoGro off the track entirely. As they rolled onto lap 38 the damage was tremendous, Max was dead onto Hamilton as that battle had cost him all of his 5+ second lead. The silver lining for Hamilton, however, was Verstappen, too was delayed behind Sirotkin, crucially giving a bit of breathing room to the race leader. Lap 40 continiued the rain of bad news for Perez, a drive thru for utterly losing his mind. Taking advantage of all the fuss, both Alonso, Sainz and Leclerc were in, with just Ericsson and Vandoorne to go, oh yes and Stroll. 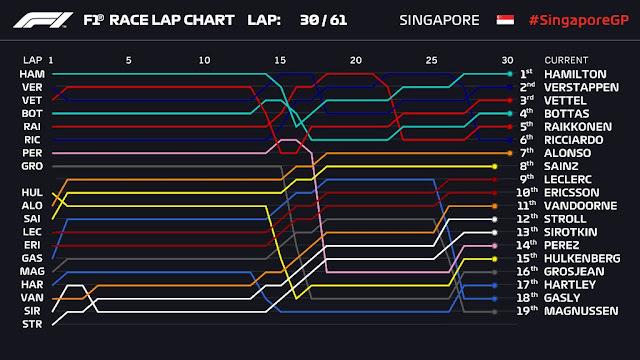 Barring any further acts of insanity, that put them the last of the points leaders, and with a nice tyre strategy battle to boot: Alonso on the Softs, Sainz also on the Softs and rolling the dice, Leclerc on the Hypers. Lap 45 and Grosjean bore the full brunt of the steward's wrath, a 5 second time penalty as Sirotkin continued to be the widest car on the circuit, taking Brendon Hartley amazingly wide and fairly on the limit in terms of legality as he continued to hold up the Toro Rosso, which was on brand new Hypers and not wanting to waste much more time. The stewards were not impressed, and he was investigated fairly rapidly for forcing another driver off track. Not turning in now officially off the table in terms of defensive tactics as he racked up a 5 second penalty for his extreme efforts. 2 laps on, and a juicy radio message from Red Bull, as Verstappen cracked off a lap a full half second up on the race leader and his engineer told him not to bolt TOO early, although he allowed an occasional fast lap was not going to hurt their strategy. Ricciardo, too was once again dialing it up, closing in on Raikkonen, with a 5 lap advantage on tyre life and a full compound faster life looked to be getting a bit warm for the Iceman, as the final act of the race began to unfold. Plot twist, Ferrari then radioed Kimi to tell him to ignore the brake alarm, for the moment. Bottas meanwhile had rocked up behind Hulkenberg, who was rather cleverly trying to keep him out of the blue flag zone as Raikkonen was closing from behind. That didn't last long as the first blue flag was waved shortly thereafter. At the sharp end, Verstappen continued to whittle away at Hamilton's lead, within 3 seconds with 9 laps to go. But Hamilton had responded even into S2 of the following lap, and by the end of it had reclaimed all of the gap plus a bit extra. Kmag, having been pitted for a set of fresh Hypers, set fastest lap by a rather astonishing 3 seconds or so, a powerful demonstration of just how much management was taking place at the sharp end. IT was Magnussens's first fast lap, and a nice present from HAAS, assuming it lasted to the end. Bottas, meanwhile, had just gotten the news that a 1.2 second gap was required before blue flags would be waved for Hulkenberg. Valterri was not happy, as he complained bitterly that he if he got that close he'd be off the track, the walls of the circuit complicating the dirty air picture to the point that 8 seconds was the standard for having clean air in qualifying. Lap 56 and Bottas continued his radio offensive, saying it was unacceptable as his frustration mounted. Lewis had run his gap up to 6 seconds at the front and the only remaining fireworks was the potential for Lewis to catch Alonso before the end of the race, and Raikkonen to catch Bottas. With Bottas stuck behind Hulkenberg, Vettel had essentially switched off in order to get to the end without the need for another stop, and was 23 seconds off the back of his championship rival, a loss of an additional 3 points and a dagger through the heart of Ferrari fans everywhere. 2 laps to go, and 1.5 seconds between Raikkonen and Bottas. It was nothing doing though, and as Hamilton began his last turn around the circuit, the gap had changed not at all, another evil tease from the race gods. In fact, it was as much operational issues as a technical gap that was becoming the focus at Ferrari, perhaps the inevitable fallout of the unexpected loss of Marchionne at the helm washing through the team as the pressure mounted to take it to their rivals before their chances had once again evaporated. Completely anticlimactic checquers then, as another cerebral chess match failed to appear thanks to Ferrari's attempt to force the issue. Less so for Formula B, where clear headed thinking at McLaren, or from Alonso, saw the marque take the palmares for best of the rest, helped enormously by the incredibly stubborn, and eventually pigheaded defending by Sirotkin. Also helping was the spectacularly bad call at Force India to pit Perez lap 17 with the Williams in his pit window, although it may well have been the fact that his tyres left them no real option. In fact, with a bit of hindsight he was starting to lose time to the Williams on lap 15, and Vettel's overtake at the start of lap 17 cost him nearly a second, and he continued to bleed time until he pitted at the end of his lap 17, when the damage had been done. With a bit of tinfoil, given they rock Mercedes engines one could be forgiven for thinking perhaps Force India were just doing a bit of a favour for their PU overlords.... But that's just crazy (albeit entertaining) talk and the truth is that Perez couldn't maintain the pace needed to make their optimal strategy work. What's perhaps most interesting, and worth serious consideration, is that the tyres Pirelli brought created the strategic opportunities they were meant to, but only in the midfield, where those who started on the Ultras were able to convert by running long with good pace and switching to the Softs. One also wonders what might've been had the Renault Spec C not had its issues for Verstappen, given Hamilton's issues with keeping the Soft tyres warm. But with the number of races dwindling and his lead at 40 points, such things are quickly forgotten.